My brother was nine years old when I was born. Mum always called him Cyril; she did not agree with nicknames. But from the day he commenced school, he was "Johnny" to me, for at school I discovered that he was known as "Johnny Johnson". 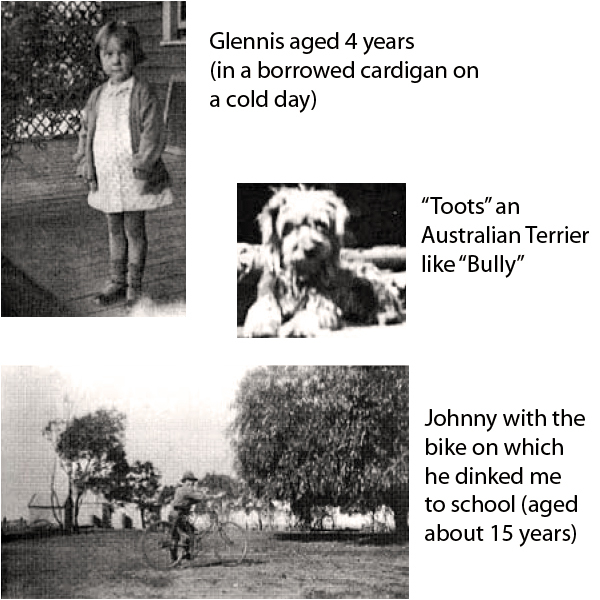 Apparently he had been called names such as "Sissy Cyril" or "Sooky Cyril" in his early days at school, but by the time I was introduced to the school system, he was about to leave school and by then was well established as "Johnny". Strangely, later in his life those schoolmates who had nicknamed him "Johnny" reverted to calling by his correct name, but I never did. As a small child my brother was the centre of my life and I followed him everywhere. My memories of those early years are of a living, doting big brother on whom I could rely to amuse and protect me. As I grew old enough to be left in his care and he became old enough to be responsible for taking care of me, my parents would occasionally go to town without us. I remember the happy times we had jumping on the unused mattress of the old double bed kept out on the verandah, ready for the hot nights when Mum and Pop would sleep outside in the cool. We used it as a "trampoline", (though I had not heard the word as a child), jumping from the ends, into the middle and back again. Johnny being so much older, and bigger than I, made me fly high in the air when he jumped on it. It was great fun. If Mum had been home he would have been told to stop for fear I might be hurt. But I was never hurt. He was very careful with me. Johnny was afraid of most large animals such as horses and cows and was not keen on sheep either. For a farmer's son this was always a very sore point with Pop. Neighbours have told me how my mother always saddled up the horse for my brother every morning before school, and how on his return he would hang the reins over the front gate, leaving the horse waiting for my mother to unsaddle and feed. Cows too were of no interest to him. He hated milking. Cows had to be baled and legroped. Even then Our Jersey cows were not averse to lobbing the odd leg in a bucket. Mum often did the milking, and as soon as I became adept enough bringing in the cows, milking and feeding the calves became my responsibility. Though he may not have been keen on handling horses, cows or sheep he would never hurt a defenceless creature. He would shoot pests and predators like rabbits and foxes and ducks for sport during the duck shooting season. He did not enjoy killing sheep or chopping the heads off "chooks". He did it because he sometimes had to, but he did not enjoy it. Later, when he made the decisions, he preferred to buy meat in town rather than do his own killing. He enjoyed shooting on the rifle range for the skill of it. The rest was part and parcel of life on the farm. My brother had been taught the piano. He had wanted to learn the guitar, but my mother would not hear of it. According to my mother the piano was the basis of all music. She was probably right, but my brother found the piano boring. He used to say it almost turned him off music completely. However, it gave him the grounding he needed to fulfil his life-long love of music expressed through his brass and dance band activities. When he was about 14, the Ultima Brass Band was formed. He and Des Leach decided to join. On a calm summer's evening Johnny would be practising on our verandah, while the sound of Des, also practising, would waft across the breeze from half-a-mile away. The band took part in competitions and concerts, led the Anzac Day marches and the procession opening the local Agricultural Show in Swan Hill. Once he found the cornet and trumpet he was hooked and played them for many years. The Ultima Brass Band disbanded early in the war and Johnny then joined the Swan Hill Brass Band. In later years, as his lip became too thick for the cornet, he transferred to the trombolw. My father was never keen on my brother's pursuit of musical expression. When he began playing for dances he would often be out more than once a week playing. Naturally, he would hot bath each time. My father who had been brought up the hard way, living in the bush without the necessary home comforts and a lack of water, thought it a great waste. Hee would often say to my brother "too much bathin' '11 weaken ya". When I say I grew up on the farm at Meatian, I wonder if that is really a true statement, for, looking back it seems to me I never really "grew up". In some ways I don't think I was ever a child to grow up. You see, the farm was like a world of its own to me. From our front verandah, for as far as the eye could see, was my father's land; land no longer covered by mallee, but cleared and fenced, covered with either fresh green wheat growing neatly in furrows, stubble from the wheat crops or fallowed paddocks dotted with sheep. On the horizon was the row of trees bordering the farm, about a mile and a half away. To me, this seemed to be the whole world; not just the world of just my parents, my brother and I.
I was in an adult environment with no other child of my own for miles. My parents were quiet people. Our life was an isolated one. Our nearest neighbours were George and Ivy Leach and their children Muriel, Des and Dorothy, who lived only half-a-mile away, and my father's brother Albert, my Aunt Annie and my cousins Len and Marge, who lived diagonally across the corner of the roads that formed the border of our farm. They were about two miles away by road, but a little over a mile as the crow flies. Though the distance was not great, contact was only occasional. My cousins Len and Marge and Leach's children were all much older than I. These age gaps, combined with minimal contact in my early years, probably led me to believe that I was also a adult. There was certainly adult conversation all around me; I was spoken to in adult terms, though in the traditional sense I was expected to be "seen and not heard" while adults were engaged in conversation. This developed in me a keen sense of observation, of listening, analysing and evaluating. My only role models were adult, so I followed their example and behaved as they behaved, or tried to. My earliest experience with the outside world of children was at a tin-kettling for a local newly-married couple. A tin-kettling was the local means of welcoming a young couple to their new home. All the neighbours would turn up at night bearing gifts for the couple's home. As they did so there would be a great banging of pots and pans or anything that would make a noise, including stones on the tin roof. Whole families went, including children. I vividly remember this, my first experience of how the other half lived, or played, in both adult and child terms. I was beside myself with anguish at the behaviour of the children. They were jumping on beds, running through the house and screaming at the tops of their voices. It was bedlam. Alarmed, I ran to my mother. "Mum, the children are jumping on the furniture, they're running through the house; Mum, come quick!" She looked at me calmly and said, "well, don't take any notice of them, just so long as you don't do it." My mother was not perturbed a bit; she actually appeared to condone it! How could she? We didn't run through our house. I had always been told to wipe my feet on the door mat, sit down carefully in a chair, lift it not drag it, and that chairs, lounges and such were made for sitting on certainly not for jumping on. I was bewildered, and spent the rest of the night just walking around watching in amazement a world of little people apparently gone mad. Both my mother and father came from large families, each being one of 10 children, so looking back I can understand why rowdy children did not affect her. It was I who was growing up in isolation, not her. Looking back I sometimes think of the biblical text which says "Train up a child in the way he should go: and when he is old, he will not depart from it". (Proverbs 22:6) The first five to seven years of a child's life are also considered to be the "formative" years. In these years many of our concepts are formulated. Until I started school, I saw little of the outside world. The protective cocoon of isolation wrapped me in an environment of gentle nurturing, introversion and solitude, while observing the outside world through my own anonymity. A few things stand out in my memory of those pre-school years. I remember my mother spanking me when I was so small that I cannot remember what it was for. And I do remember sobbing my heart out under the tank-stand. She looked out of the kitchen window at me from time to time but did not console me. It was a terrible shock. Like my brother, I did not test her out again, but spent the rest of my life trying to be a "good child". My mother spent many hours making clothes for me. She was not an enthusiastic dressmaker. That was her sister Bert's speciality. My mother preferred to knit and embroider. As I grew I was dressed in some beautifully knitted clothes, and I often felt embarrassed by my mother's knitting. I particularly one lovely outfit she knitted - a red skirt with a white lacy top. The top had a red cord and pompoms round the neck. So many people would come up and remark how lovely I looked because of my mother's knitting, I felt I was always hiding behind her gigantic frame. She was always very careful of my welfare. Only once did she make a mistake that I can remember. I must have been about three or four years of age. She gave me a glass lemon squeezer to play with. I remember sitting on the ground outside our old house. I had dropped the lemon squeezer on a rock. It broke and I cut my finger, so deeply that I still have the scar. Other than that my mother protected me from all harm, even to the point of standing on the dam bank watching me in fear I might drown if I ventured in. My brother swam in the dam which was about 11 feet deep and very cold. He had also placed a 4 gallon drum on the edge as a diving board. There was a pumped-up car tube and also an old door that floated on top of the water for safety. Yet even when he was in the water with me, my mother's fear transferred to me and as a result I never learnt to swim. From the time I could talk my mother encouraged and taught me to sing. One of my earliest recollections is of waking in the back seat of my father's 1925 model Dodge as we travelled home after Sunday School concert. I must have been about four years of age at the time. This particular year she had taught me a song about being my Mother's little helper. "I'm Mummy's little helper, I help her all day long" went the words of the song. I can no longer remember the rest of the words or the tune, but I knew it was a hit as I heard my parents happily relating how I had "brought the house down". I only remembered standing up on the stage singing my heart out in front of all the people and running back to my parents, to the sound of loud clapping, amid a sea of smiling, laughing faces to bury my face in my mother's lap. But I didn't remember the house falling down. Sunday School played a large part in my life when I was a child. My father was Church of England, my mother Methodist, but Pop didn't seem to worry about his church so we attended the little weatherboard Methodist church at Meatian. The Methodist community was heavily involved during the 1930s raising funds to build the church. The Ladies Guild worked hard to raise money. The church was built at low cost during these depression years, but I suspect that paying for the building and furnishings went on for some time, necessitating the organisation of further fund-raising events. My mother would cook cakes, crochet doyleys, knit or bottle fruit but she would not sell raffle tickets. She believed these were a form of gambling. To raise money though she would run a "naming the doll" contest. This was acceptable as it required some effort in order to win. I remember one year she ran a contest, strangers asking me what my name was and then saying to her "put that down then". Surely, I thought, that would be last name Mum would give the doll. I was right, of course. They were all doomed to failure and a large percentage were eliminated that way. and she would not tell me the name she had chosen until after the event. Throughout each year the church held concerts, fetes and harvest Thanksgivings, all of which raised money for the church building programme. Church fetes were held at Lalbert for both Meatian and Lalbert churches and the proceeds were shared. While my mother was at the Church fete in Lalbert one year she was called urgently to the telephone. My brother who was 12 or 13 at the time, was attending school in Melbourne and was staying with Aunty Bert. Aunty Bert had had to get a message to her to come quickly as my brother was ill. Not knowing what was wrong or how ill he was, my mother and I jumped on the next train which luckily happened to be due in a few hours. When we arrived in Melbourne, we found Aunty Bert in a very emotional state. My brother had appendicitis. The doctor had operated. As he had removed the appendix it had burst in his hand. Johnny was very ill in hospital for some time. My mother and I stayed with Aunty Bert until he was well enough to return home to the farm. From then on, my mother was always loathe to let him leave her again. One of my mother's most prized possessions was her eight day chiming clock. Most people in our community had a mantel clock, but no other clock chimed quite as melodious]y as my mother's. It was made of walnut wood veneer and took pride of place in the centre of our lounge-room mantelpiece. It chimed every quarter of an hour in a sing-song fashion: 1,2,3,4 (quarter past); 1,2,3,4 _ 5,6,7,8 (half past); 1,2,3,4 - 5,6,7,8 - 9,10,11,12 (quarter to); and 1,2,3,4 - 5,6,7,8 - 9,10,11,12 - 13, 14, 15, 16 before striking each hour with strong, bell-like strokes ONE, TWO, THREE slowly and majestically like the finale of a masterful symphony. My father always wound the clock every Sunday morning with a large silver key. As he wound the clock he taught me to tell the time. Telling the time was applauded as a major accomplishment for a five-year-old. It was very useful for my parents too. Many times I was sent off from the shearing shed, cow yard or from hanging around Pop while he was killing a sheep to "see what the time is dear. It must be nearly teatime". Teatime could be anytime, as my family would drink copious cups of tea at the drop of a hat. Eventually I woke up to the fact that by the time I returned from the house with the time, the sheep was killed or the shearers had stopped swearing. During the summer and school holidays we were often visited by our many city relatives. Any relative who could afford the train fare (and some who could not), or who had a vehicle that could survive the over 200 mile trek, was welcome. This particular year, 1935, we were visited by cousin Ray Watt and his motorbike, which made it up from the city but apparently needed considerable tinkering to make it back. Ray was Aunty Ellen's second son. He was about 20 years of age, but at times he suffered from incredible deafness. I knew because my mother once sent me to tell him his lunch was ready, while he was busy with his bike. He was working in the shade under the pepper tree, which by now had grown quite large and provided a canopy of shade for animals, humans and vehicles on a hot day. I remember relaying the message to him. "Ray, lunch is ready." No reaction whatsoever . "Ray, Mum says to come to lunch." I moved closer and raised my voice. I shouted and walked around him, calling out to him. I jumped up and down. He definitely must have gone deaf. He neither saw me, nor heard me. Bewildered I returned to my mother who had been watching the performance from the verandah. "He won't answer. Why won't he answer?" I asked my mother. "Never mind," said Mum, "he'll come when he's hungry," and we went inside. That evening, as we sat in the lounge room I noticed Ray seemed to have recovered from his deafness. He wore a wrist watch. He saw my interest, and as I climbed up on his knee I investigated it, gently touching and admiring it. "Do you like my watch?" Ray asked. "Oh, yes," I said. 'Would you like a watch of your own?" he asked. "Oh, yes," I replied. "Well, if you can tell me the time of your mother's clock I'll give you a watch of your own," he said. I couldn't believe my ears, but I didn't hesitate. I turned to look at my mother's clock and immediately told him the exact time. I was very careful to make sure I was right. I could not risk a wrong answer. Poor Ray was completely taken aback. He looked at my mother and father and gasped, "but you're too little to tell the time." "No, I'm not," I said. "Pop taught me." When his holiday was over Ray packed his belongings on his bike and rode away with our voices ringing in his ears (if he was listening). "See you next year, Ray." I was not worried that I had not yet received the promised watch. Ray would send me one when he returned to Melbourne. Country children are used to waiting for things. In the country you cannot rush down the road to the shop immediately you decide you want something. You learn to wait. So, I waited. The days went by. My brother brought the mail home from the Post Office all the three days each week the train brought the mail. As the trains came and went, the days dragged into weeks and still nothing came from Ray. I began to ask, "where is my parcel?" The weeks dragged into months. Disappointment set in. Ray had forgotten. He had made a promise and not kept it. To a five-year-old it was unforgiveable. A small heart was broken. Anger, resentment, loathing, hatred, oh, the enormity of the feelings. How could he break a promise? A five-year-old knew nothing about wages, or jobs. I doubt that it ever occurred to me, in 1935, that a watch was a luxury which many people could not afford. All I could think of was that Ray had promised. I had not asked him. He had promised, and a promise was a promise. By September, 1936, thoughts of Ray and the watch took second the place to another promise, this time made by my mother. The 3rd September was my sixth birthday. I had been looking forward to starting school. My mother had said I could start school when I was six. I jumped out of bed and dressed and presented myself to my mother in the kitchen. "Guess what?" I said. "Today's your birthday," said Mum, "many happy returns, but what are you doing all dressed up like that?" "I'm going to school," I said. "To school?" said Mum. "Yes," said I, "you said I could go to school when I was six, so I'm six today and I'm going to school." Poor Mum. She had to sit down. She looked at me for a moment and then said, "but we're in the middle of shearing; I have the men to feed. Didn't you realise the school year starts in February? It's only September. You can't go to school until after Christmas." She must have looked pleadingly at me. "But," I staunchly protested and stated, "you said I could start school when I was six. You promised." My mother was an honest lady with high moral values. She also knew when she was beaten. This six-year-old didn't realise she had meant February instead of September. This child had to go to school today, Thursday, and she knew it. Mum heaved herself to her feet. "Sit down and have your breakfast," she said. Then, thinking out loud she declared, "well, Cyril will have to dink you on his bike. We can't spare the car today. Your father can't leave the shed and I can't take you in the gig. It would take all day. The men have to be cooked for. The shearers won't wait." As I ate my breakfast Mum rushed off to the shearing shed to let Pop know that morning tea would be a bit late as a mini-crisis had occurred in the kitchen. On her return my mother began to prepare my lunch box. My brother came in. "You'll have to dink your sister to school today. She says she's going to school because it's her birthday and I said she could," Mum told him. My brother looked at her and said, "she's been saying for weeks she was going to school when she was six." "I know," said Mum, "but I didn't think she meant on the very day. Get me a cushion to tie on the bar of your bike. There's no other way for her to go today." I followed as Johnny went to get the cushion. "I'm six and I'm going to school," I chanted. Johnny looked at me and said, "happy birthday!" As I look back on that day, I see my mother rushing down to the shearing shed to tell Pop that everything would be a bit late because I had to go to school. But Pop took it in his stride in his usual way. Anything was allowed so long as the shearing was not delayed. My cousin Ted Warren, who was Aunty Ethel's eldest son, and his wife Dora, lived in Kerang. Ted worked on the railways there. They would often visit us at weekends and holidays. They were young and childless. Dora devoted her love to her little Australian terrier "Bully", who she treated like a child. When they visited us us they would bring the little dog with them. Once when Ted and Dora stayed with us, Bully disappeared. We searched the farm for him but he had gone. Dora was terribly worried; she could not sleep. Ted was in Kerang at this time. She rang him, worried that the small dog may try to find his way back home. The weather was hot as usual and the little dog had very short legs. If he had set out for home, we believed he would never make it. After much searching and worrying it was finally decided to take Dora home. As we left the farm we were all very low, believing the little dog was lost forever. However, we would not give up hope and decided that Pop should drive slowly all the way so that we could keep a sharp watch in case he was heading home. We were almost half way to Kerang, and had just passed a farmhouse which was close to the road. Suddenly Dora, who had been glumly looking out of the window, jumped up. "There he is; there he is. Stop the car." Pop pulled up. The car had hardly stopped rolling when Dora was out, racing into the bush along the roadside. There was the dog, puffing and panting, still running along on his little legs. Dora grabbed him, laughing and crying at the same time, hugging and cuddling him and talking to him as she carried him to the car. To have survived so long out in the heat - it had been six days since he had disappeared - we reasoned he must have been taken in and looked after by someone along the way. We did not have time to go back to ask at the house we had just passed, but always believed they must have taken him in. If they had, he had escaped and continued on his way, heading in the right direction for home. I was very intrigued with this little dog, so much so that on my sixth birthday Ted and Dora presented me with an Australian terrier puppy. We named him "Tootles", but soon shortened it to "Toots". Though Pop was not impressed with what he called "toy animals" on the farm, he made no protest at my having the dog. Toots became everyone's friend. He was a real character, with all the spirit of the terrier. He would take on anything, no matter how big it was. No other animal could beat him. His favourite pastime was chasing rabbits. Outside our back gate the mallee stump heap housed unknown numbers of rabbits which burrowed underneath it. He loved to crawl down these burrows. For hours on end we would hear him barking in the bowels of the earth at the rabbits, who no doubt were quite safe. He was tenacious though, and only gave up when exhausted and in need of a drink. He would then back out of the burrow having had a lovely time. He wasn't a snappy little dog. We only saw him snap once, after Johnny and Des Leach had been rabbit shooting and came home laden with rabbits tied to the bars of their bikes. Rabbit was one of the mainstays of farming menus, for they were an abundant pest in the mallee. Toots greeted them and started sniffing around the carcasses. Des was holding one of the rabbits and flicked it at Toots. That was the only time we ever saw him snap at anyone, but we all agreed it was Des's fault for teasing him. Toots also had a bad habit of chasing cars. Every time a car came to the house he would run up to meet it, barking and chasing. When they left he would again chase after it. My mother, who was determined to cure him of this habit, tried calling him off which he completely ignored. She tried smacking him when he came back, but that didn't do any good. Then she had the bright idea of tying a short, solid piece of wood round his neck on a string, just long enough to hit him on his front legs as he ran, so he would be forced to stop. The stick was firmly tied around his neck in anticipation of the next opportunity. My mother was sure she had fixed him this time. When a car was approaching the house, Mum was out on the verandah to see what would happen. We all followed. Off he went, full tilt after the car, the stick banging against his front legs. Without losing a stride the canny little terrier bent his head down, grabbed the stick in his mouth and continued after the car. It stopped him barking, but did not impinge on his favourite pastime one little bit. After that we all gave up. Nothing could stop him chasing cars. At least on the farm he was only a hazard to himself, for there was not much traffic. Ted was very special to me as a child. He brought youth into my life. Ted and Dora spent Christmas with us each year and were there when Father Christmas came. It was to him that I took my presents first on Christmas morning, for he would enjoy the search through the pillow slip and the dolls on the bed. He would always say to me, "You had better take it in and show it to your mother." My mother must have felt left out, but it came naturally to share my toys with Ted. He would have made a wonderful father. He was there when we put sixpences and threepences in the Christmas pudding. Without Ted, Christmas would have been just the same as any day. He was there when my mother tried to make me eat something, I was always a picky eater; I did not feel hungry. My mother used to make me take a white powdered substance, called Glucodin, which was supposed to make me eat. I doubt that it did me much good. One day my mother was trying to force me to eat. I felt that if I did I would vomit. She threatened to go outside and get a switch to make me eat. As she walked out the door to do so, and I had no doubt she meant what she said, Ted said, "come on, you'd better eat it up." I ate some more for him and avoided the punishment.